David Morrell, better known as the writer of the novel the first Rambo movie was based on, wrote a spy trilogy in the early 1980s that has just been released in ebook format. 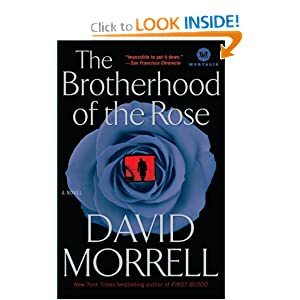 The first, Brotherhood of the Rose, follows two orphans that have been raised as brothers and trained to become expert operatives for a secret branch of the CIA. One of the things that sets this book apart from other spy novels is a great concept – on the eve of WWII all of the directors of the various intelligence organizations banded together to create secret spy safe havens. A spy could go to one of these safe houses to retire in peace without worrying about anyone settling old scores. Not only is this an intriguing and semi believable idea, Morrell milks all of the twists and turns that are possible when two spies that are mortal enemies become trapped in the one place where they are prevented from harming each other. Last words: Brotherhood is not that convincing if you are hoping for a look at real tradecraft. However, when viewed among other spy thrillers this ranks very high with not only interesting and unique characters, but a really neat concept. As a special bonus here’s the trailer for the 1989 TV miniseries they made of the book.